"A dynamic God: Living an unconventional Catholic faith"
"Mairs is an extraordinary woman. The acclaimed author of the spiritual autobiography Ordinary Time suffers from multiple sclerosis, yet is able to write with passion about a God that others in her position would have walked away from a long time ago. A convert to Catholicism, Mairs often finds herself on the other side of the political and ideological fence from her church's hierarchy, but her gift for finding the sacred in everyday life is so steeped in a Catholic worldview that she must keep practicing her faith. The author draws strength from prayer and some religious devotions, but she focuses that strength through her political activism in a world that needs justice. Her self-deprecating humor is wonderful�much like the writing of Anne Lamott, although Mairs manages to create her own style. As one who suffers from a debilitating disease, Mairs has been continually challenged with the spiritual truth that it is who people are rather than what they do that makes them worthy of divine love. This is a tough but integral lesson for anyone who takes spiritual matters seriously. Through her writing, Mairs illustrates the difference between orthodoxy and faith. She chooses the latter, and given her life experiences, she should know." "For those struggling with contradictions between organized religion and their personal beliefs, this testament to living an intimately unique brand of Catholicism will be welcome reading. Inspired by the beauty and the mysticism inherent in the ritual, Mairs, a convert to Catholicism, is able to divorce herself from the restrictive dogma, fashioning an affirmative alternative to the institutionalized Roman Catholic Church. Unconcerned by threats of excommunication or by accusations of being a 'cafeteria Catholic,' she embraces a dynamic God, worships and celebrates communion�without benefit of a priest�and, above all, devotes herself to the call to social action she sees as the bedrock of her faith. Although dogmatic Catholics will dismiss her views as heresy, the more spiritually minded will find food for thought and much to embrace in these thought-provoking pages. "A Dynamic God is rich, risky, and startling. It is a remarkable book. Read it." When Nancy Mairs published her "spiritual autobiography" Ordinary Time, Kathleen Norris greeted it in the New York Times Book Review as "a remarkable accomplishment," calling Mairs "a relentlessly physical writer, as fiercely committed to her art as to her spiritual development." Mairs's new book on spirituality describes the alternative brand of Catholic worship that she observes in the American Southwest. Raised Congregationalist in New England, Mairs is a convert to Catholicism. She is also feminist, radical, political activist-and all this in a church that tends to scorn her kind of progressive iconoclasm. A Dynamic God explores why and how Mairs deals with those contradictions and still identifies Catholic (Zen Catholic, as she sometimes says), and what she finds to love in that tradition. Doctrinally, Mairs parts ways with the mainstream Church with few regrets. The people she worships with celebrate communion in each other's homes without a priest, discuss politics, and defy Church opposition. But the Catholic rituals and imaginative structures that Mairs loves shape her life. In the Latino image of the Virgin of Guadalupe, for instance, she finds inspiration for a commitment to social justice. In her unmistakable, vibrant voice, she writes about sin and abundance; understanding vocation in a life circumscribed by multiple sclerosis; and celebrating life. Nancy Mairs is author of seven books, all published by Beacon Press. They include Waist-High in the World, Ordinary Time, Voice Lessons, Carnal Acts, and Remembering the Bone House. She lives in Tucson, AZ, with her husband, George. Title: "A dynamic God: Living an unconventional Catholic faith"
"God Is Not Great: How Religion Poisons Everything"
Review and/or order this book safely at 40% off the list price from the Amazon.com online book store. An audio CD and download are also available. *Starred Review* God is getting bad press lately. Sam Harris' The End of Faith (2005) and Richard Dawkins' The God Delusion (2006) have questioned the existence of any spiritual being and met with enormous success. Now, noted, often acerbic journalist Hitchens enters the fray. As his subtitle indicates, his premise is simple. Not only does religion poison everything, which he argues by explaining several ways in which religion is immoral, but the world would be better off without religion. Replace religious faith with inquiry, open-mindedness, and the pursuit of ideas, he exhorts. Closely reading major religious texts, Hitchens points to numerous examples of atrocities and mayhem in them. Religious faith, he asserts, is both result and cause of dangerous sexual repression. What's more, it is grounded in nothing more than wish fulfillment. Hence, he believes that religion is man-made, and an ethical life can be lived without its stamp of approval. With such chapter titles as '"Religion Kills' and '"Is Religion Child Abuse?' Hitchens intends to provoke, but he is not mean-spirited and humorless. Indeed, he is effortlessly witty and entertaining as well as utterly rational. Believers will be disturbed and may even charge him with blasphemy (he questions not only the virgin birth but the very existence of Jesus), and he may not change many minds, but he offers the open-minded plenty to think about. Copyright � American Library Association. "Hitchens, one of our great political pugilists, delivers the best of the recent rash of atheist manifestos. The same contrarian spirit that makes him delightful reading as a political commentator, even (or especially) when he's completely wrong, makes him an entertaining huckster prosecutor once he has God placed in the dock. And can he turn a phrase! : 'monotheistic religion is a plagiarism of a plagiarism of a hearsay of a hearsay, of an illusion of an illusion, extending all the way back to a fabrication of a few nonevents.' Hitchens's one-liners bear the marks of considerable sparring practice with believers. Yet few believers will recognize themselves as Hitchens associates all of them for all time with the worst of history's theocratic and inquisitional moments. All the same, this is salutary reading as a means of culling believers' weaker arguments: that faith offers comfort (false comfort is none at all), or has provided a historical hedge against fascism (it mostly hasn't), or that 'Eastern' religions are better (nope). The book's real strength is Hitchens's on-the-ground glimpses of religion's worst face in various war zones and isolated despotic regimes. But its weakness is its almost fanatical insistence that religion poisons 'everything,' which tips over into barely disguised misanthropy." Copyright � Reed Business Information, a division of Reed Elsevier Inc.
"A century and a half ago Pope Pius IX published the Syllabus of Errors, a rhetorical tour de force against the high crimes and misdemeanors of the modern world. 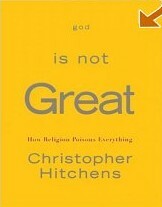 God Is Not Great, by the British journalist and professional provocateur Christopher Hitchens, is the atheists' equivalent: an unrelenting enumeration of religion's sins and wickedness, written with much of the rhetorical pomp and all of the imperial condescension of a Vatican encyclical." "Hitchens, who once described Mother Teresa as 'a fanatic, a fundamentalist, and a fraud,' is notorious for making mincemeat out of sacred cows, but in this book it is the sacred itself that is skewered. Religion, Hitchens writes, is 'violent, irrational, intolerant, allied to racism and tribalism and bigotry, invested in ignorance and hostile to free inquiry, contemptuous of women and coercive toward children.' Channeling the anti-supernatural spirits of other acolytes of the 'new atheism,' Hitchens argues that religion is 'man-made' and murderous, originating in fear and sustained by brute force. Like Richard Dawkins, he denounces the religious education of young people as child abuse. Like Sam Harris, he fires away at the Koran as well as the Bible. And like Daniel Dennett, he views faith as wish-fulfillment." Copyright � The Washington Post. Title: "God Is Not Great: How Religion Poisons Everything"
"Bad Faith: The Danger of Religious Extremism"
Harvey Cox, Professor of Divinity, Harvard University; author of "The Secular City" and "When Jesus Came to Harvard"
"Kressel's work could not be more timely. It has the advantage of taking religious movements with thoughtful seriousness and making vital distinctions clear. It is also written in a lucid and readable style." Raymond F. Paloutzian, author of Invitation to the Psychology of Religion; co-editor of "Handbook of the Psychology of Religion and Spirituality;" editor of "The International Journal for the Psychology of Religion"
"This book sparked my interest so much that I read it 3 times. Its topic is timeless and urgent and the dilemma is big. . . It is full of information with sobering accounts of historical and contemporary acts of violence in the name of Christianity, Judaism, and Islam. . . Briefly said, this book is excellent." "Bad Faith is a profound book dealing with a complex problem. . . Kressel is never judgmental, and often goes out of his way to try to understand and explain the most obnoxious ideological props used to justify terrorism. This makes his exposure of the 'bad faith' that is at the root of contemporary terror that much more effective." Ervin Staub, author of "The Psychology Of Good And Evil" and of "The Roots Of Evil: The Origins Of Genocide And Other Group Violence"
"This well written, engaging and compelling book addresses the great, current danger of religious extremism, especially in Islam. 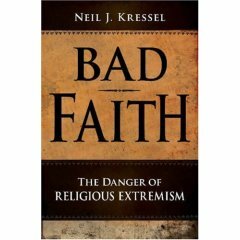 . ."
"Kressel has written an excellent book exploring religious extremism. . . Even if one rejects some of his tentative answers one cannot but admire the fact that he asks the right questions." 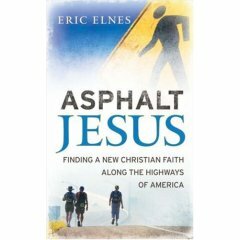 Title: "Bad Faith: The Danger of Religious Extremism"
"Asphalt Jesus: Finding a New Christian Faith Along the Highways of America"
Title: "Asphalt Jesus: Finding a New Christian Faith Along the Highways of America"
"The Phoenix Affirmations: A new vision for the future of Christianity"
Amazon's description: The Phoenix Affirmations, named for the town in which the principles were created and the mythological bird adopted by ancient Christians as a symbol of resurrection, offers disillusioned and spiritually homeless Christians and others a sense of hope and a more tolerant, joyful, and compassionate message than those we often hear from the media and some Christian leaders. These twelve central affirmative principles of Christian faith are built on the three great loves that the Bible reveals: love of God, love of neighbor, and love of self. They reflect commitments to environmental stewardship, social justice, and artistic expression as well as openness to other faiths. Transcending theological and culture wars, inclusive and generous in spirit and practice, these principles ask believers and seekers alike to affirm their Christian faith in a fresh way. Title: "The Phoenix Affirmations: A new vision for the future of Christianity"
Cost: List: U.S. $12.95. Amazon.com sells it for $6.60 plus postage, for a saving of 49%. You can ask Amazon.com for free but slower shipping on most orders of US $25.00 or more. "The Bible Against Itself: Why the Bible Seems to Contradict Itself "
"All books are written for or against some point of view, and the books of the Bible are no different. Bible book authors were often motivated to write because they wanted to challenge or correct those who had written before them. As Helms explains, The Bible is a war-zone, and its authors are the combatants. Paul said of Peter, I opposed him to his face, because he was clearly in the wrong (Gal. 2:11). Helms notes that Jeremiah condemned the entire religious establishment of his time the very same people that other Bible authors held in highest esteem: prophets and priests are frauds, every one of them (Jer. 8:10). Luke felt the need to write another gospel even though many writers have undertaken to draw up an account of the events (Luke 1:1). Luke obviously felt that Mark's gospel was filled with errors and edited it freely. Not even Mark's account of the words of the dying Christ was left unaltered." "It isn't a very long book, but there is so much in it I was amazed. Its the single best book I've read on the subject of the Bible. I think that believers need to read this book and think about the documents that make up the basis for their faith and where those documents came from. This book showed me the human side of the texts that make up the bible, and why so much of the bible is well, confusing. The authors style is very quick I'd say, you dive right in without any apologies like in Dennetts 'Breaking the Spell'. I liked that, it got to the meat of the matter and challenges the reader to keep up with the point the author was trying to make. Atheists and Believers should check this one out." "Randel Helms may be the world's most underrated biblical scholar. This is probably due to a few factors: First, the smoothness and accessibility of his writing; second, the brevity of his books relative to other scholarship; and, third, his primary approach of addressing the bible as literature, and examining it in terms of style, allusion, metaphor, and historical perspective." "His new book, The Bible Against Itself, is the third in a trilogy of such examinations, the previous books being the excellent Gospel Fictions (1988), and Who Wrote The Gospels (1997). All short books, they each contain as much detail and scholarly citation as books four times their length." "The Bible Against Itself delves into many of the outstanding contradictions in the bible, and helps explain them by showing how various books in the bible were written in opposition to other books, to dispute them and hopefully supplant them. ..."
"Read this book. Read about the prophets calling the other prophets blasphemers, the Paulist Christians labeling the Jacobite Christians dogs and sinners, and vice versa, and the apocalyptic authors erring again and again, but continuing to predict anyway (using as their sources the errors of previous apocalyptic theories)." "You'll love it. It's a great book." For those who regard the Bible as God's Word, and who believe that God inspired its authors to write material that is free of error, this book will be very distressing. Helms approaches the Bible as a series of historical documents written by many authors, each of whom were promoting their own particular spirituality while correcting what they believed to be errors on the part of earlier authors. We didn't realize that the Hebrew Scriptures were such a battleground of competing beliefs. Helms is on our short list of authors of whom we automatically buy anything that they write. 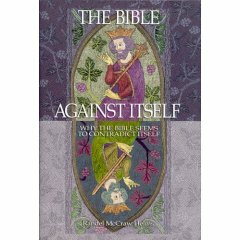 Title: "The Bible Against Itself: Why the Bible Seems to Contradict Itself"
Cost: List: U.S. $21.95. Amazon.com sells it for $14.93 plus postage, for a saving of 32%. You can ask Amazon.com for free but slower shipping on most orders of US $25.00 or more. "A secular faith: Why Christianity favors the separation of church and state"
Amazon.com: Darryl Hart, the highly regarded historian of religion, contends that appeals to Christianity for social and political well-being fundamentally misconstrue the meaning of the Christian religion. His book weaves together historical narratives of American Protestantism's influence on the nation's politics, and commentary on recent writing about religion and public life, with expositions of Christian teaching. The tapestry that emerges is a compelling faith-based argument for keeping Christianity out of politics. This stunningly good book is not about the United States Constitution but about the mission of the City of God. Wilfred M. McClay, University of Tennessee: Darryl Hart�s thoughtful, witty, and challenging book...could hardly be more pertinent today. Leo P. Ribuffo, George Washington University: Hart makes a powerful Christian case for the separation of church and state. Even secularists should appreciate Hart. Michael Horton, Ph.D., Westminster Seminary California: The fact that Hart's viewpoint is so unique today measures the shallowness of the public conversation on this crucial issue. Daniel McCarthy in ToryAnarchist.com: Promises a more nuanced take on Church and State than what's found in most other recent volumes on the subject. Library Journal: Hart provides a much needed religious and historical perspective on the relationship between church and state in the United States. Darryl Hart contends that appeals to Christianity for social and political well-being fundamentally misconstrue the meaning of the Christian religion. His book weaves together historical narratives of American Protestantism's influence on the nation's politics, and commentary on recent writing about religion and public life, with expositions of Christian teaching. The tapestry that emerges is a compelling faith-based argument for keeping Christianity out of politics. A Secular Faith is sure to provoke a firestorm of debate among evangelicals and those who oppose their political activities. Hart concludes that church and state should be rigorously separated, However, he justifies this stance by using a different approach from other commentators. He notes the damage that the state has inflicted on religion through history. He suggests that Christianity should concern itself only with the salvation of individuals by focusing on spiritual pursuits. He sees a major role for individual Christians to promote social justice, but no such role for religious organizations. Christianity's proper role in politics and culture is thus indirect: to inspire people who "may be capable of holding public office responsibly." However, Christian faith groups should not attempt to influence government policies directly. James Dobson, Pope Benedict XVI and Jim Wallis are certain to be unimpressed by this book. However, the Daniel of the Bible would be pleased. Title: "A secular faith: Why Christianity favors the separation of church and state"
Cost: List: U.S. $26.95. Amazon.com sells it for $17.79 plus postage, for a saving of 34%. You can ask Amazon.com for free but slower shipping on most orders of US $25.00 or more.